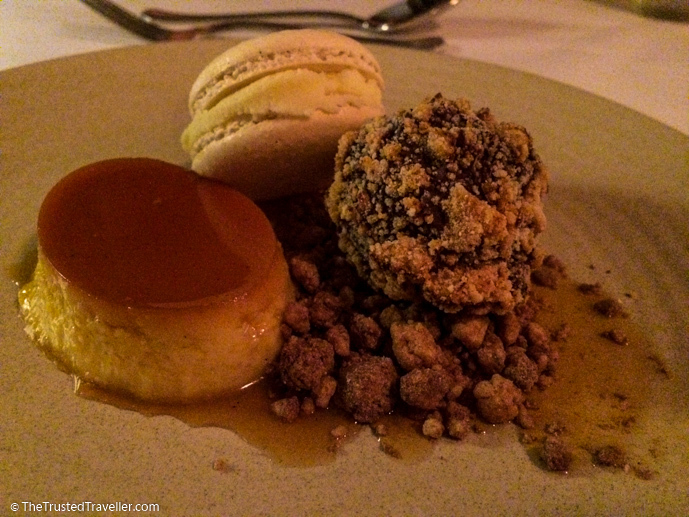 When I say the phrase, ‘culinary regions of Australia’, what are some of the first regions that come to mind for you? I’m going to hazard a guess and say that you at least thought of Australia’s culinary capital, Melbourne, or it’s biggest city, Sydney. And maybe those in the know might have thought of Mudgee or the Adelaide Hills, two of Australia most prominent foodie regions. 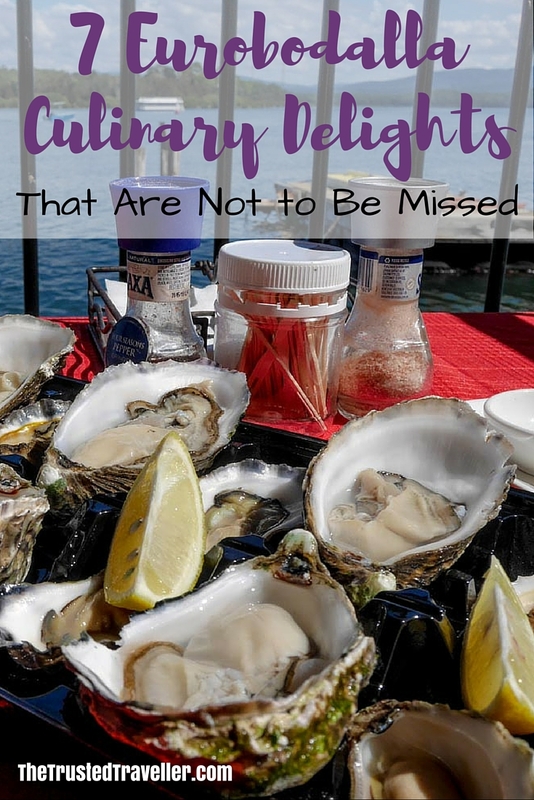 These are all wonderful places to indulge in a culinary treat or two but today I want to tell you about another region that might not be so well know to you for their culinary delights. Maybe you’ve heard about the regions spectacular beaches or sleepy seaside towns full of charm. 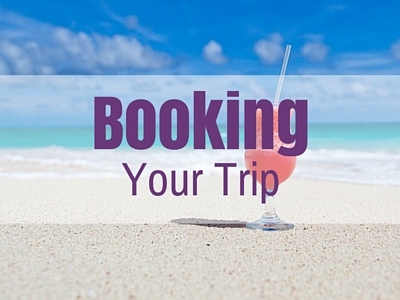 But after reading this we hope you’ll be wanting to visit to experience the cuisine too. I’m talking about the New South Wales South Coast region of Eurobodalla. 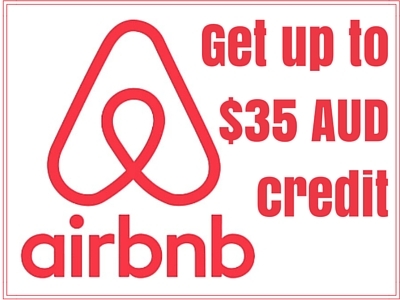 Eurobodalla is one of four regions to occupy the coastline south of Sydney. 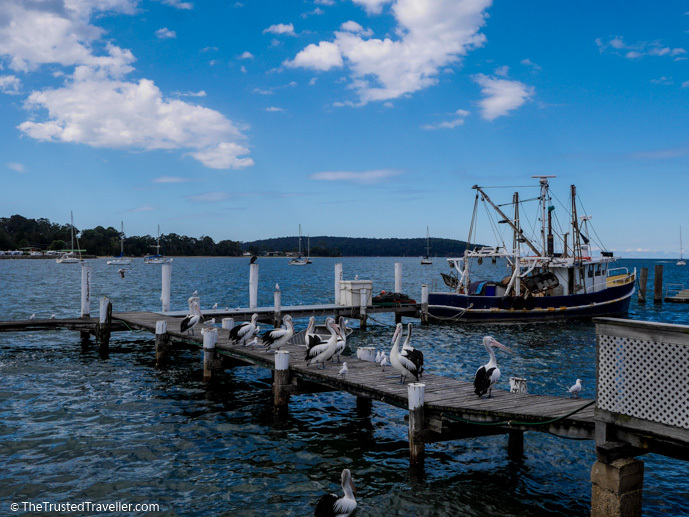 It is home to well known towns like Batemans Bay, Moruya and Narooma, as well as historic villages like Mogo, Tilba and Bodalla. Most who visit this part of Australia go there for the beaches and laid back vibe, and to be honest that’s why we chose to start our Australian road trip there. But now having spent a few weeks exploring the region, we think it needs to be on everyone’s foodie radar. Why? Well it’s in the heart of Australia’s oyster coast for one. It’s also home to a unique weekly market where you can only buy produce from local sources. It’s a world class dairy region. And it has over the years, and still does, attract some of the worlds best chefs to set up restaurants because of the abundance of incredible produce available nearby. Have I sold it to you yet? 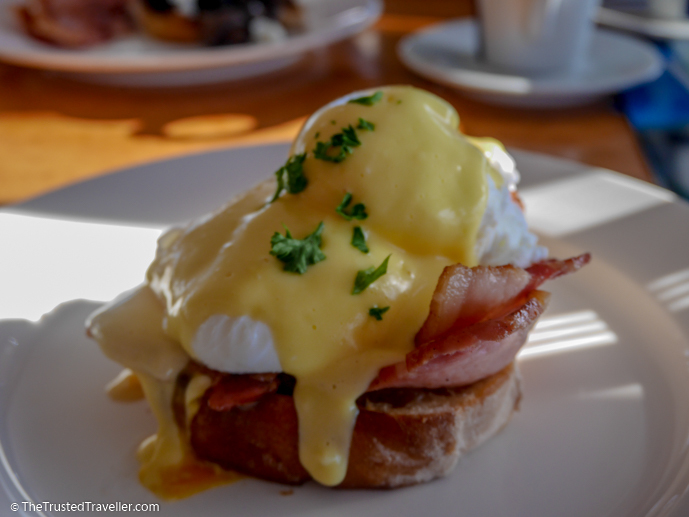 Well if you need just a little more convincing, here are seven Eurobodalla culinary delights we enjoyed during our time in the region and think they are not to be missed. 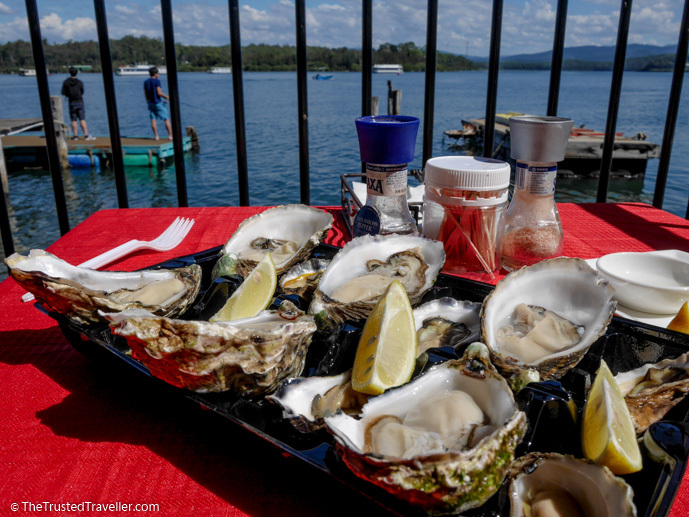 We hope that these and the many more you can find on the Eurobodalla tourism website will inspire you to choose Eurobodalla as a culinary destination for your next trip. Located on the banks of the Clyde River, the Oyster Shed is the ultimate farm gate experience for oyster lovers. 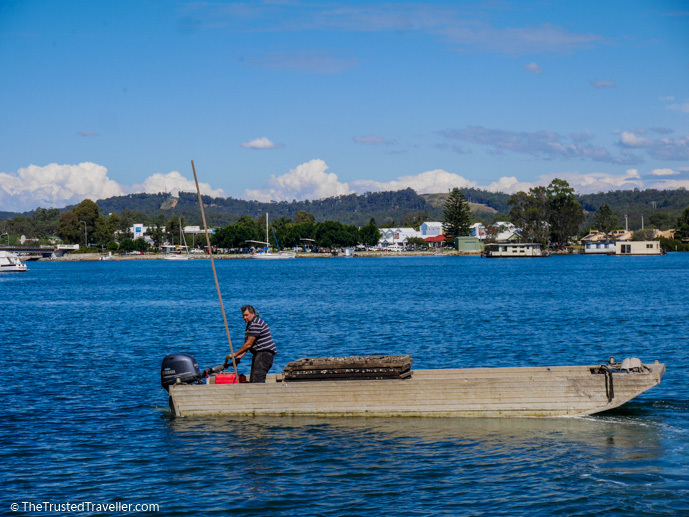 Here they farm and sell both Sydney Rock oysters and Pacific oysters in the crystal clear waters. As well as enjoying a dozen of their oysters in the sun overlooking the river, you must be sure to speak to the lovely owners, Mark and Enola. Mark is a 4th generation oyster farmer and he’s been working in the family business for coming up to 40 years now. They both have lots of stories to tell and are full of information about the processes involved in oyster farming. 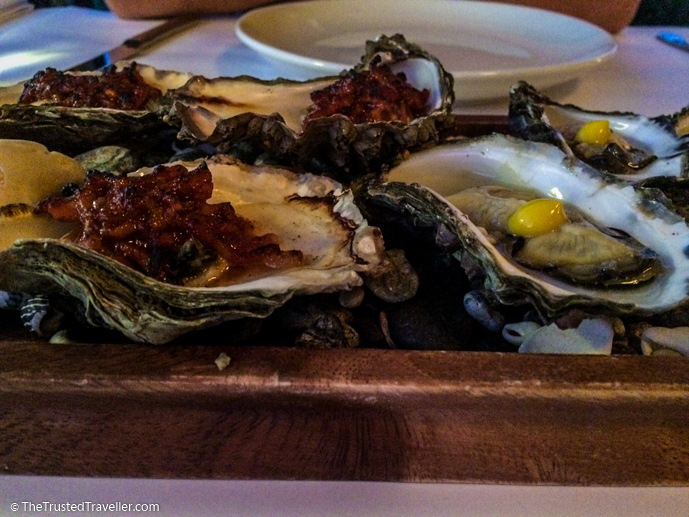 What We Ate: Half dozen each of the Pacific and Sydney Rock oysters with a squeeze of lemon. 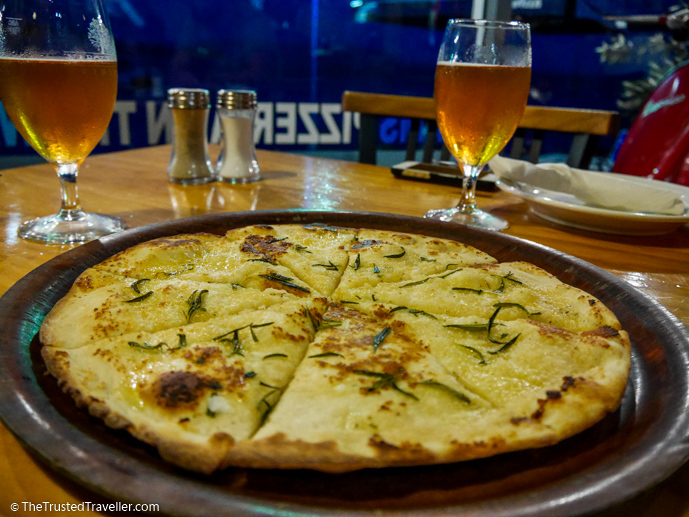 Pizza doesn’t get much better than what they serve at Sam’s and it comes with a prime waterfront position too. Emma and Jo have done an awesome job creating authentic woodfired pizzas, some with a twist. 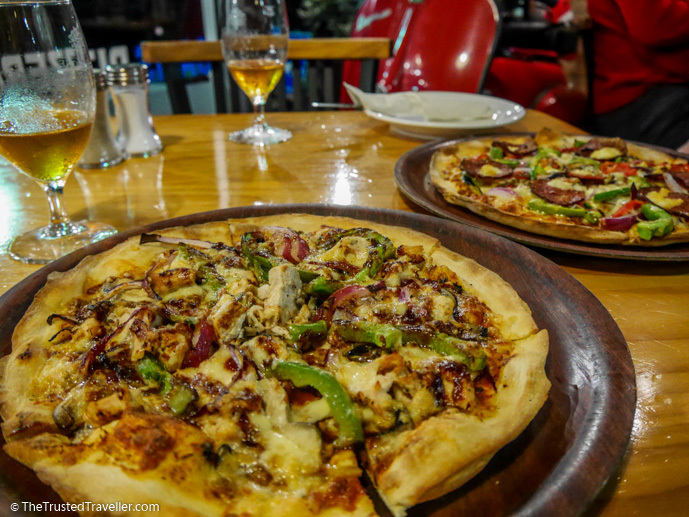 They keep the toppings light, the pizza base is chewy yet soft with a crunchy crust, they love their beer with a guest craft brew or two on the specials board and the service is some of the friendliest we’ve come across in our travels. 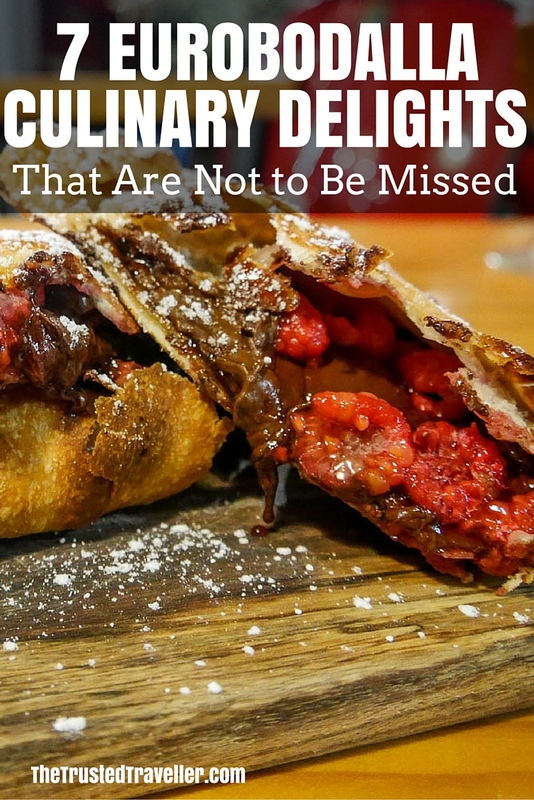 But what really made it one of the best pizzerias we’ve eaten at, was the Calzone Dolce. 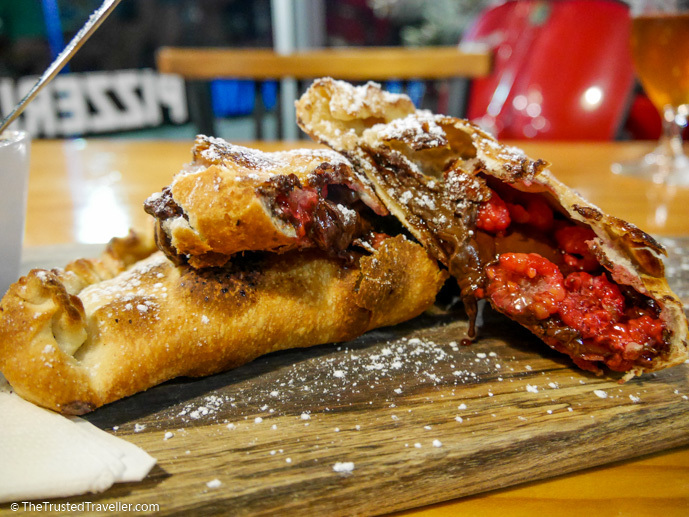 We are dessert people so finishing our already excellent meal off with a delicious dark chocolate and raspberry filled calzone served with creamy vanilla ice cream, really topped off a great experience for us. What We Ate: Starter: Garlic Pizza Crust with Rosemary and Sea Salt | Mains: BBQ Chicken Pizza and Em’s Pizza | Dessert: Raspberry and Dark Chocolate Calzone. 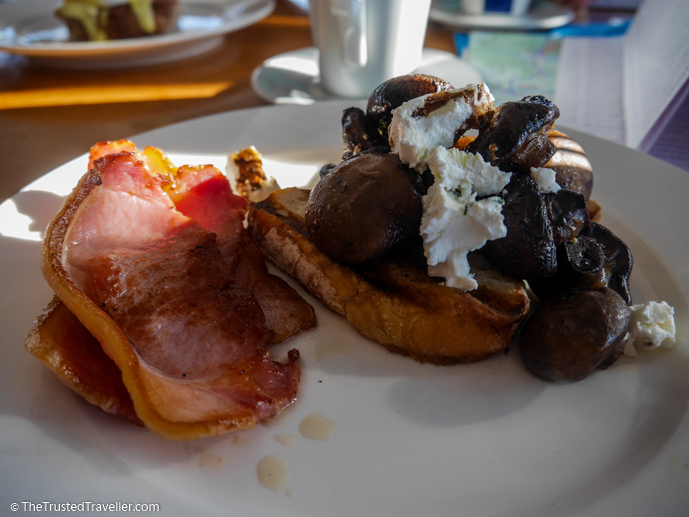 “The” place to go for breakfast in Batemans Bay is the Starfish Deli. Like Sam’s they are located right on the waterfront with inside and outside seating that takes in the beautiful views of the Clyde River. Their breakfast menu has everything you’d expect with a few unique items to give it the edge over it’s competitors. Our meal and coffee’s were perfectly presented and tasted delicious, so much so that we wished we’d been in the area long enough to go back and try some of the other menu items or even stop by for lunch or dinner. The service too was exceptional and we had a lovely chat to one of the waitstaff who offered us suggestions on things we could see and do in the area. And every time we walked past during our time in Batemans Bay the place was busy, which to us is a sure sign of good restaurant. What We Ate: Mushroom Bruschetta with a side of bacon and Eggs ‘Benny’. 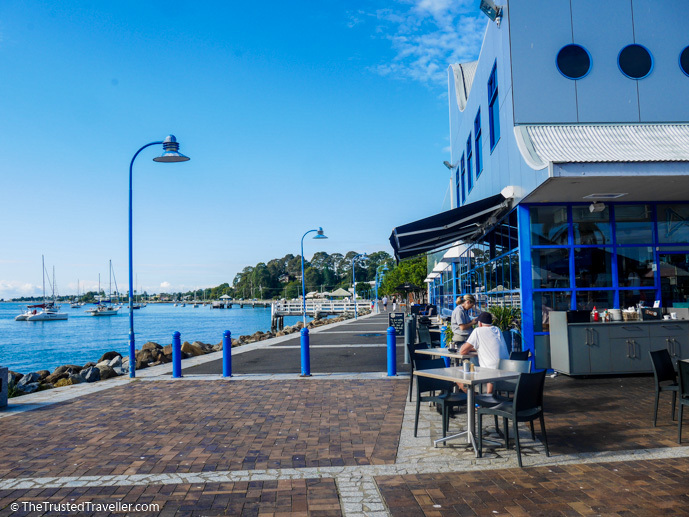 Do a Google search for the best fish and chips on the New South Wales South Coast and the Innes’ Boatshed, right on the waterfront at Batemans Bay, will be one of the top results. There are dozens of similar take-away’s along the Eurodoballa coast and we tried a few, but Innes’ always came out on top for us. Their seafood is as fresh as you can get with trawlers bringing in new catches each morning right to their very own wharf. I’m not usually a fan of battered fish as I find it too heavy, but their batter is so light and crisp, almost like a protective film over the fish helping to keep it juicy. And enjoying their culinary delights sitting on their back deck overlooking the water and pelicans didn’t do any harm either. 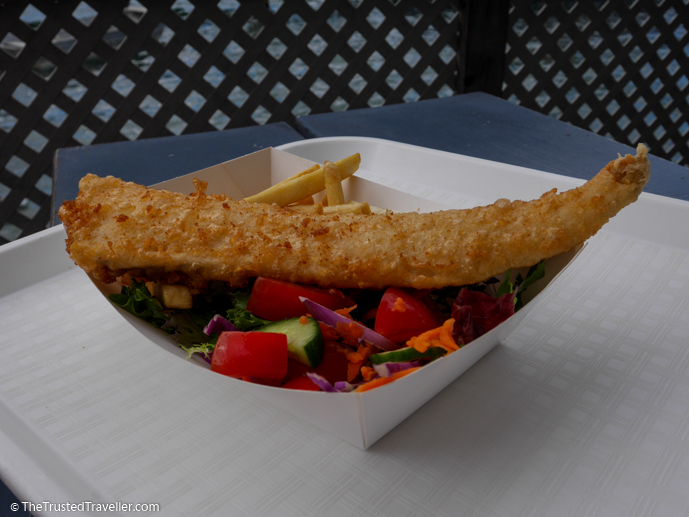 What We Ate: Battered Fish of the Day with Chips and Salad plus a Prawn Skewer. 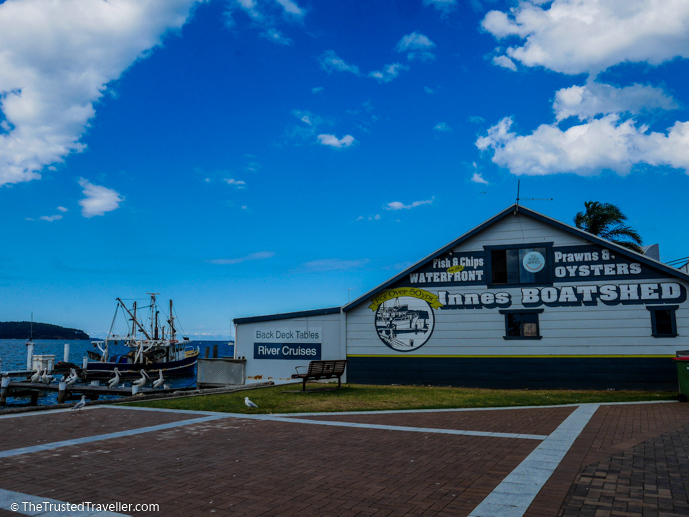 More Information: Innes’ Boatshed is located at 1 Clyde St right on the waterfront in the heart of town. Sage Farmers Market isn’t just your everyday run of the mill food market. It’s main purpose is to provide a marketplace for locals and visitors to the region to access locally grown or harvested food direct from the producers. 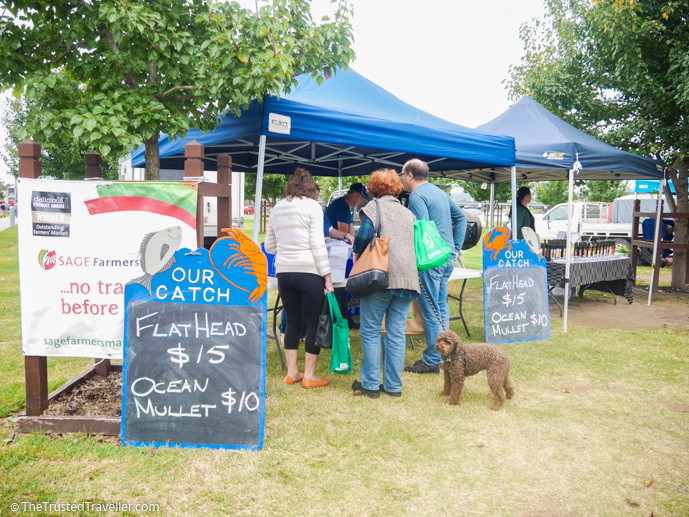 And one of the main criteria for stallholders is that their produce must be from within 160 km of Moruya. The market is held every Tuesday afternoon and you can even pre-shop online for collection on the day. Some of the things we saw (and bought) for sale during our visit were fresh seafood and meats, cheese and other dairy products, an abundance of fresh produce all in season, olives, chutneys and sauces, eggs and fresh honey. It gets pretty busy there and some of the vendors sell out quick so our top tip is to get there just before they open, say around 2:45pm and have a browse before sales start. Once the bell that signifies the official start of the market rings, you’ll already know what you want to buy. 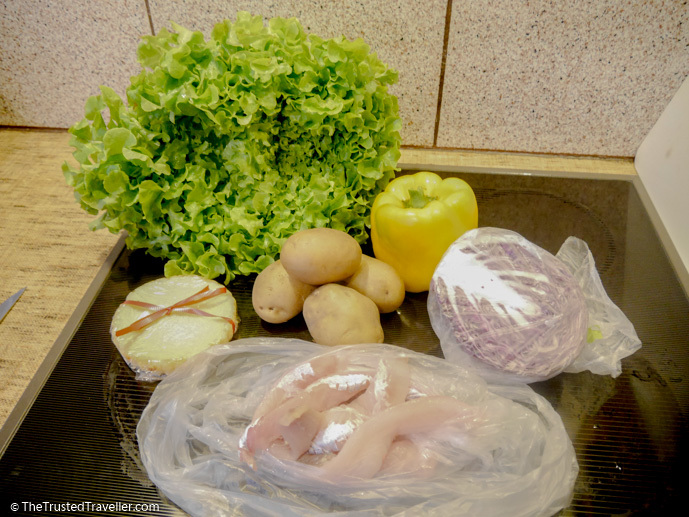 What We Ate: We purchased flathead fillets from a fishmonger; potatoes and lemons to make lemon potatoes and lettuce, red cabbage, capsicum to make a salad from the green grocer; and a lemon tart to share for dessert. Interested in our Pan-Fried Fish, Lemon Potato and Salad Recipe? You’ll find it on Instagram by using the hashtag #OnTheRoadRecipe. And don’t forget to follow us on Instagram too for more recipes like this as we road trip around Australia. The New South Wales South Coast is famous for it’s dairy with one of the countries biggest producers of cheese, Bega, located there. And while we enjoy Bega cheese, we are much more boutique style cheese people. And that’s exactly what the Bodalla Dairy Cheese Factory is. The call themselves artisan cheese makers which means the cheeses are all hand-made, in small batches, with traditional old-fashioned methods. 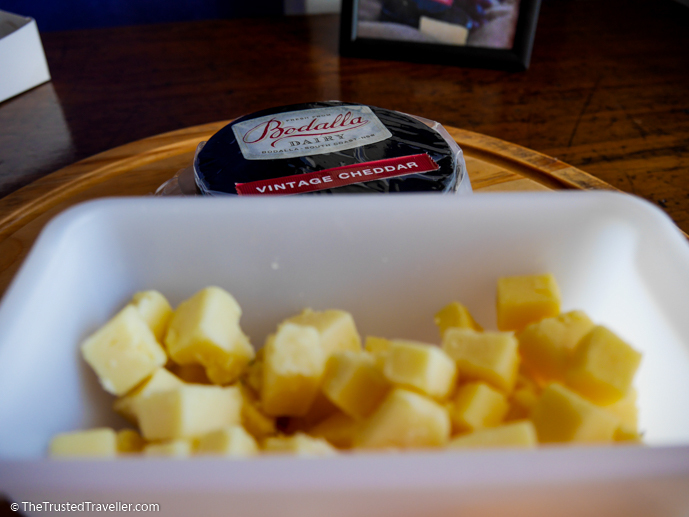 And I must say after visiting a few cheese places recently, you can really taste the different between the mass produced stuff and the cheeses made at Bodalla. Onsite you can visit the factory where you can peak through glass windows and watch the cheese makers at work There’s a small education centre there also where you can learn about the cheese making process and their business. 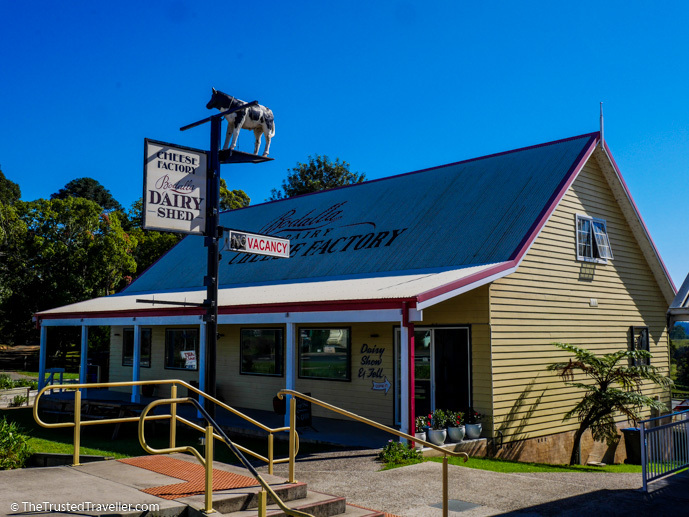 Next door in the Bodalla Dairy Shed is where the fun begins, you get to taste the cheese. 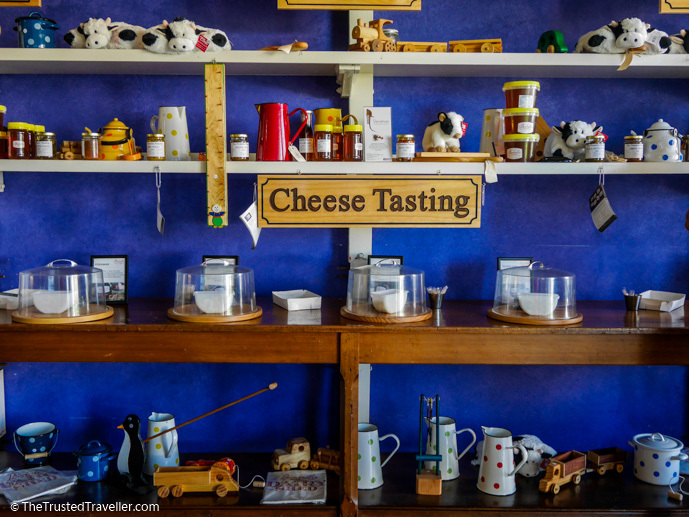 On our visit they had about 10 cheeses out for tasting and of course because we are good travel bloggers, we tasted them all for you so we could report back how nice they all were (someone’s gotta do it right!). They also have a cafe onsite where you can get cakes, burgers and irresistible milkshakes made with Bodalla Dairy Milk. All of this can be enjoyed on their back deck overlooking the green countryside. 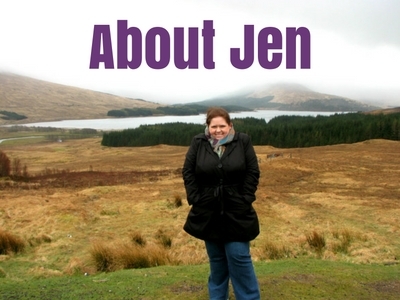 What We Ate: Cheese tastings and a Chocolate Thick Shake. We wanted to splash out on a fancy meal on the South Coast because, as I mentioned earlier, so many of the world best chefs are setting themselves up there. After looking around at the menus of each of the best restaurants we settled on The Whale in Narooma because of ex pro-surfer turned chef, Matthew Hore’s, philosophy. He has a preference for local ingredients and simple clean flavours and has a created an intriguing menu, that I read, regularly changes depending on the availability of local produce. Matthew sources his meat from the butcher next door, seafood from his mate the fisherman and fresh produce from their very own whale garden along with foraged items here and there. Our three course meal was nothing short of delicious with well matched flavours and produce that tasted so incredibly fresh. They also have a pretty decent wine list and good selection of beers on tap. 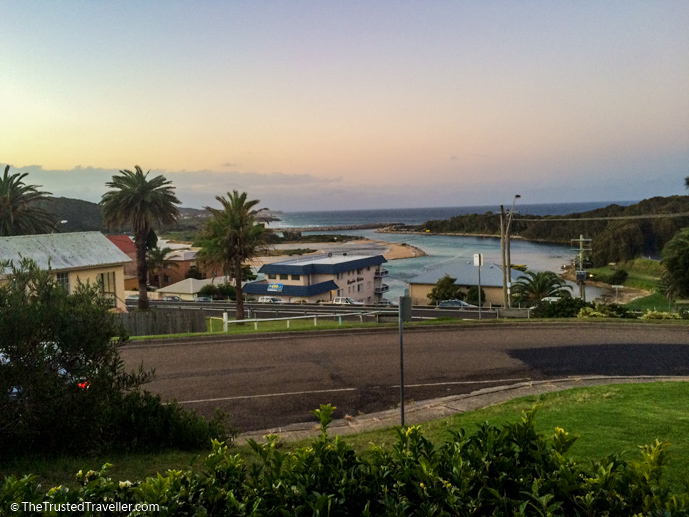 And then there’s the view, a million dollar view as we heard many call it while in Narooma. With the sun setting over the town and water, it was a perfect view for an almost perfect evening. What We Ate: Entree: Natural Wogonga Inlet Rock Oysters, half with Lemon Gel and half with Smokey Bacon and Worcestershire Sauce | Main: Crispy Sous Vide Port Shoulder and Crispy Lamb Shoulder | Dessert: Crème Caramel and House Made Lindt Bitter Sweet Chocolate Ice Cream. We would like to thank Eurobodalla Tourism for assisting with some of the culinary delights we experienced. As always, all opinions expressed in this post are our own and were not influenced in any way by receiving complimentary meals. 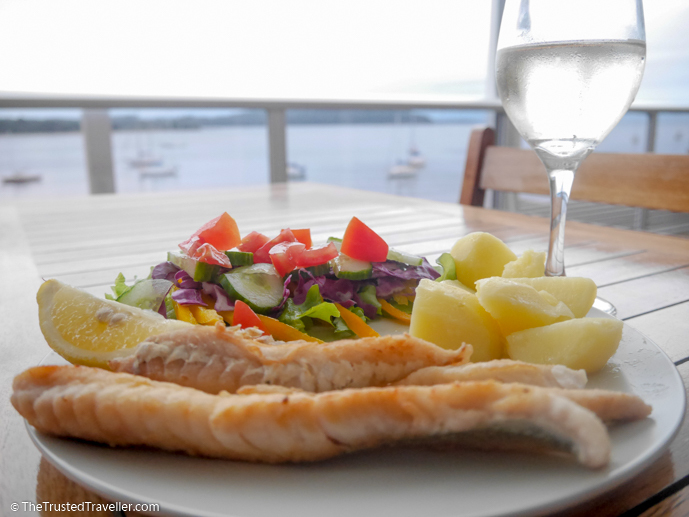 Which of these Eurobodalla culinary delights makes your mouth water? Are you temped to visit this region for their food now?